Cannot Convert Word to PDF with Hyperlinks? Solved! We all at some point have reached a point where we want to convert a PDF document to a Word document or a Word document to a PDF and always wonder how to go about it. You might have googled for solutions only to find that a lot of programs don’t work right? Or if they did work, the hyperlinks on the other hand didn’t work right? So here we mainly help you to solve the problem of cannot convert Word to PDF with hyperlinks. PDFelement ProPDFelement Pro is a very useful PDF Converter. With the help of this smart PDF Converter, you can convert the PDF document to many popular image formats such as JPG, PNG, GIF, TIFF, BMP, etc. The quality is maintained, and you can add as many pages you want. 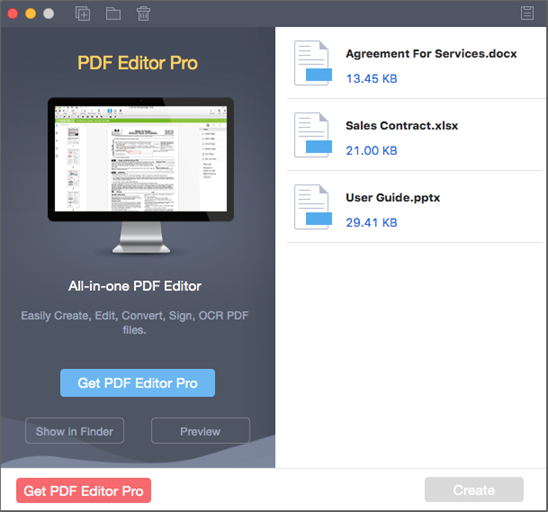 Well I recommend you to use the most reliable, powerful, and effective program called iSkysoft PDF Creator for Mac (or iSkysoft PDF Creator for Windows). Not only does it offer word to PDF conversion but also PowerPoint and Excel conversion too. It converts any word document into a PDF file without any loss or inactive hyperlinks or distortion of the documents contents such as formatting. In addition to its powerful capabilities, it’s able to save PDF documents with low file size unlike all other programs. The Windows version also comes with powerful PDF editor tools allowing you to edit texts, images and more in PDF as easy as in Word file. Formatting – You can save the word document to PDF with no loss in format such as fonts. Also all your hyperlinks are preserved as active and clickable form the document. Fast – This program can convert large batch of files very fast. This saves on time and workload too. Productive - You are allowed to import mulitple Word files and convert them to PDF in batch. Quality - The output PDF files will be in high quality and can be supported by any PDF reader and editor. After download the program, drag and drop the program file on the “Applications” folder. The free version of the program can only create one file at a time and the output comes with a watermark. The full version, comes with advanced features and supports batch processing with no watermark. After installation is completed, launch the program. · Drag and drop files directly to the program. · There is an “Add Files” button on the top right corner of the screen. · The final method is through the “Add folder” also on the top right corner of the program. Once the documents are uploaded, click on the “Create” button on the bottom right corner of the screen. Select the destination to save the new generated file and after conversion is done click on “Save”. After conversion is complete, click on the “PDF” button and select the “Show in folder” option in order to find the converted files. Open the files to preview to preview. Many documents might include one or more hyperlinks in them especially research papers or table of contents and references. Once these documents are converted to PDF from Word format, the hyperlinks become inactive. Trying to save the word document as PDF form the “save as” doesn’t help either and also saves the document with a large file size. Also you might try other programs such as OpenOffice with the “export as PDF” format. This might work but the end file is of very low quality and mainly the documents formatting, such as bullets and fonts end up being corrupted. Also the output documents are of very poor quality. This leaves little to be desired for the final documents. As some word versions like MS Word 2011 might save the word documents as PDF, the link are not clickable and this makes zero difference in solving this problem. > Create PDF > Cannot Convert Word to PDF with Hyperlinks? Solved! What Is the High Quality Word to PDF Converter for Creating PDF with Ease?